HOLLYWOOD, Sept. 30.--New sustainer for Mutual was set this week when it was announced that Results, Inc., starring Claire Trevor and Lloyd Nolan would start airing October 7 from here. Mystery serial, written by Sgt. Larry Taylor, will be broadcast from 7-7:30 p.m. Combo has appeal and with the usual West Coast build-up should be a top program. HOLLYWOOD, Dec. 23.--The time formerly occupied by Results Incorporated, airing from here, is being taken over by bank-roller of Detroit Symph, stretching the time from half to a full hour. Teeing off October 7 over Mutual, Results has been airing here from 6-6:30 (PWT), following Detroit Symph in the 5:30 slot. Don Lee says that Results, which has been a sustainer, will have to be ditched because of no available time. It was a New York Mutual deal in the first place, to be produced in Hollywood, and it is up to the Eastern office to make further arrangements, if any, for the airer. Show featured Lloyd Nolan and Claire Trevor. When the program was first launched trade here felt that Mutual was trying to make a pitch for "whodunit" fans. Talk here was that if show grabbed good rating it would be moved into better time spot. Syndication: Mutual Broadcasting System; Mutual--Don Lee; Rockhill Radio, Inc. Results, Inc. was transcribed for Mutual by Rockhill Radio, Inc.
All rights reserved by their respective sources. Article and log copyright 2002-2014 The Digital Deli Online--all rights reserved. Any failure to attribute the results of this copywritten work will be rigorously pursued. RESULTS, INC, a new series of comedy-mysteries bringing Claire Trevor and Lloyd Nolan, opens over WHK tomorrow night at 9. MBS, 7. 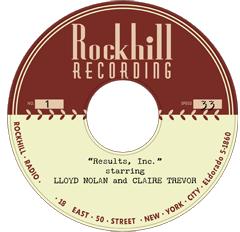 Results, Inc., detective drama with Lloyd Nolan and Claire Trevor. 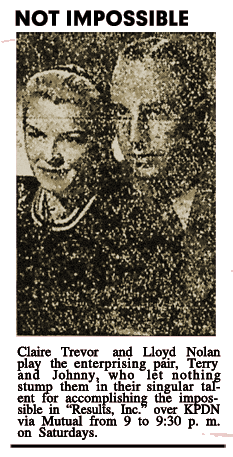 9 p.m.--Results, Inc., (WIBU): Claire Trevor and Lloyd Nolan campaign against crime in drama dealing with Cupid, comedy and crime. 8 p.m.--Results, Inc., (WIBU): "The Case of the Amorous Killer," with Claire Trevor and Lloyd Nolan. The murder of a ficticious girl and the appearance of her "body" create a mystery which Lloyd Nolan and Claire Trevor attempt to solve in "The Case of the Amorous Killer" on Results, Inc., the WOR-Mutual program at 9 p.m. The Case of the Forgetful Witch is the title of tonight's Claire Trevor-Lloyd Nolan episode of Results, Inc., over Mutual and WEBR at 9 o'clock. While investigating the morals of a young artist specializing in the sketches of nudes from life, Johnny and Terry, played by Lloyd Nolan and Claire Trevor, blunder into a murder mystery in the "Case of the Forgetful Witch," heard on "Results, Inc.," at 8 p. m. over WNOE. 8 p.m.--Results, Inc., (WIBU, WGN): "The Case of the Crazy Christmas Tree." HOLLYWOOD -- Lloyd Nolan, whose dramatic skills enabled him to overcome the secondary gangster and tough cop roles he was given in minor Hollywood sagas of the 1930s and '40s and go on to become Broadway's and television's sympathetically despicable Captain Queeg, died Friday. He was 83. Nolan, who had been battling lung cancer, died in his home in the Brentwood district of Los Angeles. Nolan was to both critics and audiences the "veteran actor" who worked often and well regardless of is material. From his film debut in the long-forgotten "Stolen Harmony" in 1934 to his warm portrayal of the neighborhood cop in 1945's "A Tree Grows in Brooklyn," Nolan came to symbolize the journeyman artist plying his trade. The Actor, who was generally credited with "A" performances in a decade-long series of "B" films, became so good, in fact, he permitted himself the luxury of turning down work, a privilege that ordinarily falls to far better known stars. Ironically, it was to TV that he owed his most singular honor. For despite the dozens of film credits he had acquired before his death, he won but one national accolade: a 1955 Emmy for his now firmly established portrayal of the crazed Philip Queeg in a television adaptation of "The Caine Mutiny Court Martial." 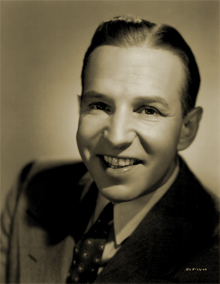 But all this was years later -- years after his dramatic studies at the Pasadena Playhouse in the late 1920s, when he kept one eye peeled toward Gower Gulch in Hollywood, where pictures were being made for little more reason than that they could now make noise. The other eye was on Broadway, where he soon was to find work, not as an actor but as a chorus boy. Nolan was out of Santa Clara Preparatory School and Stanford University when he went south to study in Pasadena. He left Stanford in his senior year to study Shakespeare and Ibsen in Pasadena and then joined a touring company of "The Front Page." Nolan ended up in New England, where he took a nighttime job as a stagehand on Cape Cod while awaiting a role that might get him back in front of the curtain. That opportunity came, he recalled, because he was spending most of his days on the beach. The resultant tan brought him the role of a pirate in "Cape Cod Follies," which eventually went to Broadway with Nolan in the chorus. He toured briefly in a series of unremarkable plays before returning to New York in 1931 as an office boy in "Sweet Stranger." He said the only memorable thing about the show was that he and an actress named Mell Efird "were in the first and third acts of the show. That gave us the whole second act for romance." They married in 1933, the same year he became a critics' favorite as Biff Grimes in "One Sunday Afternoon," a pleasant comedy about a dentist who fears he has married the wrong woman. From 1934 to 1954 he appeared in about 70 films, but only a few are remembered today: "Michael Shane: Private Detective," "Johnny Apollo" and, during the war, "Bataan" and Guadalcanal Diary." The rest found him as a gangster, a prisoner or as the guy wearing the black hat in a series of Westerns. In 1957 he was chosen with Lana Turner, Arthur Kennedy and Hope Lang to bring Grace Metalious' scandalous novel "Peyton Place" to the screen, and again critics found his performance generally superior to the script. In 1972, Nolan finally revealed a tragic secret he had carried with him for years. His son, Jay, who died in 1969, had been diagnosed as autistic, one of the first children in the United States known to be afflicted with the little-understood malady. What Nolan described as a "perfect marriage" survived the strain of bringing up an autistic child and ended only with his wife's death in 1981. He remarried in 1983 and is survived by his second wife, Virginia, a daughter and two grand-children. 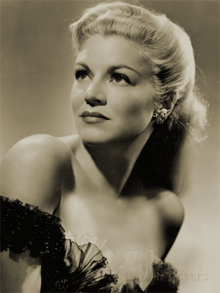 Birthplace: Bensonhurst, New York City, NY, U.S.A.
LOS ANGELES -- Claire Trevor, the sultry-voiced actress who appeared in more than 60 films and won an Academy Award for her 1948 performance as a boozy, broken-down torch singer in "Key Largo," died Saturday. Trevor died at a hospital near her Newport Beach home, said Richard Elbaum, a spokesman for the family. He did not know the cause of death. He gave her age as 90, based on a birthdate of March 8, 1910. Trevor earned Oscar nominations for "Dead End," a 1937 melodrama in which she played a good girl who grows up to be a prostitute, and for "The High and the Mighty," a 1954 airplane-in-trouble epic. She was also in John Ford's 1939 classic "Stagecoach," playing a frontier prostitute redeemed by a gallant John Wayne. In an interview with the Chicago Tribune in 1987, Trevor was reluctant to name a personal favorite among her films but singled out two she said "were the most fun to make." " 'Stagecoach,' because John Ford was marvelous. And 'Key Largo' because everyone in the cast was interesting or exciting or different," she recalled. "I could have stayed on that picture for the rest of my life. I adored it." Trevor became a close friend of Wayne's and a neighbor in Newport Beach, a wealthy enclave about 45 miles southeast of Los Angeles. "He was bigger than life, and he was as warm as the earth and as generous as Croesus," she said. In "Key Largo," Trevor played ex-singer Gaye Dawn, mistress of sadistic gangster Edward G. Robinson. In one scene, he forces her to sing "Moanin' Low" to get a badly craved drink. Trevor gamely makes it through the song only to be refused the drink by Robinson "because you were rotten." In the 1950s, she appeared in a number of television dramas and won a 1956 Emmy Award for her performance in "Dodsworth" on NBC's Producers Showcase. Her last feature film was "Kiss Me Goodbye" in 1982. She played Sally Field's poker-playing mother. In 1987, she appeared in the television movie "Breaking Home Ties" as a teacher who helps a high school boy in the 1950s. She was born Claire Wemlinger in New York. When her father, a Fifth Avenue clothier, lost his business during the Depression, she went to work to help out the family.